Out of disk space at your institute? Stuck waiting for alignment results? Can’t easily share your results with collaborators? Or, perchance, are you looking for bioinformatics experts to assist you with managing large datasets? We can help! We have develop a suite of tools which enables researchers representing various domains of science to perform complex large-scale experiments and manage their results. The efficiency of analysis tasks and security of scientific data are looked after in close cooperation with the Academic Computing Centre ACC CYFRONET AGH. Our tools reside in the PL-Grid infrastructure which allows Polish scientists and their foreign collaborators to make use of vast computational services – free of charge and in a convenient manner. The PL-Grid infrastructure provides access to life science services. These services operate on top of resources available via the PL-Grid portal at www.portal.plgrid.pl. In order to access life science services and make use of the underlying hardware resources (a detailed description of the PL-Grid infrastructure is available on the project’s website) you must first register as a PL-Grid user. This service is dedicated to researchers who perform biological research with the use of DNA microarrays. It can analyze gene expression levels and correlate them with other types of clinical data describing the target organisms. Galaxy Server is an environment for planning and performing analysis of data obtained from next-generation sequencers. Analysis tasks are implemented as multistage complex experiments (also known as workflows). This is a software package developed by Agilent to facilitate statistical analysis tasks and visual presentation of microarray data. The GeneSpring GX service is available through a remote desktop interface. Please refer to the user manual for further information. researchers. Possibility to publish your own biological samples. 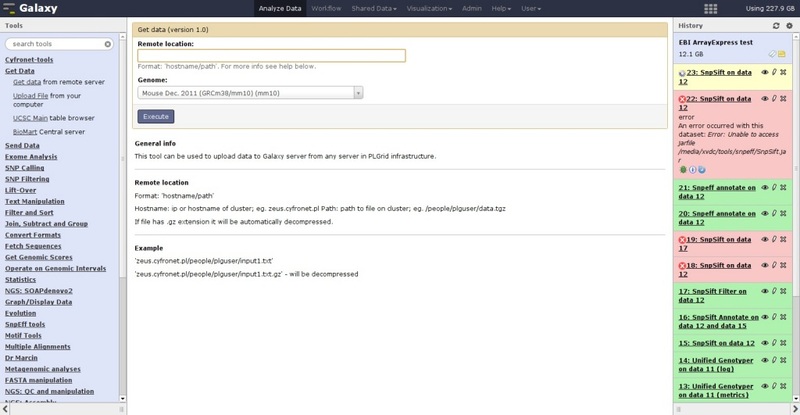 A simple, convenient web interface enabling users to manage their data in the PL-Grid infrastructure. The current release supports the Zeus computing cluster at Cyfronet. We are on the lookout for collaborators interested in jointly developing new services for the life science domain. We also offer direct support in planning and carrying out scientific research. Life science domain services are implemented in the framework of the PL-Grid Plus (grant no. POIG.02.03.00-00-096/1) and PL-Grid NG (grant no.POIG.02.03.00-12-138/13) projects. The services are being developed by employees of Klaster LifeScience Kraków and the Academic Computing Center CYFRONET AGH, in close collaboration with a network of research laboratories.